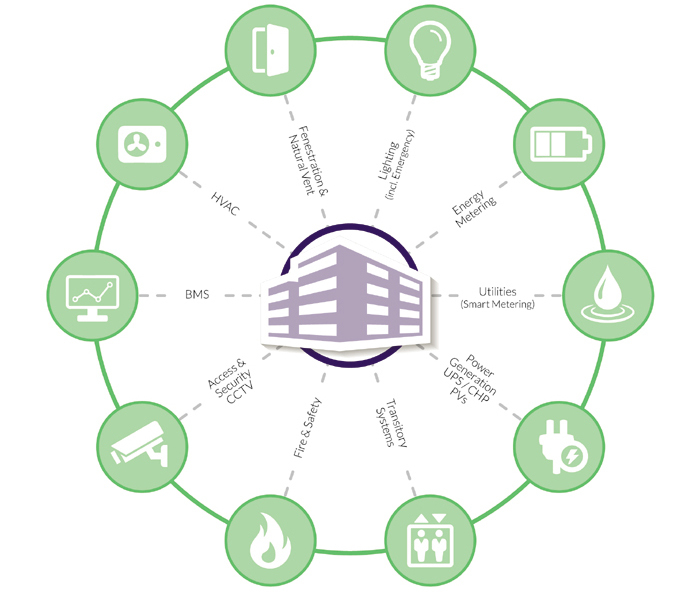 As an innovative system integrator we offer all of the main protocol technologies for our open building automation and control system solutions all of which are based on recognised European (EN) and international standards (ISO/IEC). The benefits of having an integrated system far outweigh the reasons for not having one. Fact! In principle integrated systems can exchange ‘real time’ data for improving comfort control and efficiency, demand led control can be fully realised in this scenario with both upstream and downstream dataflow providing user/building demand and in the reverse availability of services i.e. hot water, from the primary plant. Lighting controls (PIR’s) can also enable the rooms HVAC systems from standby to occupied and multi-use wall modules can control both HVAC systems (Air Con) and lighting i.e. Scenes/On/Off. Control networks and system infrastructure layout can be simplified allowing for quicker installation times at the outset and reduced maintenance/ downtime at the operation end. Future additions, expansion and at some point upgrades can be easily performed if all systems reside on a single architecture even if this architecture is made up of differing bus topology and communication types at the field level as long at the main network, for example Ethernet/IP, is used as the backbone then integration at both the automation level (main controller) and enterprise level (supervisory) can be realised. User visualisation and interface with the systems can be simplified so that all data can be easily viewed through one portal rather than having a separate PC/machine per system, the user/operator therefore has to learn one system interface only. SG Controls and Integration have much experience in integrating open systems and products that utilise various high level enterprise platforms in addition to extensive knowledge of other field bus systems and products that use open architectures such as Modbus and M-bus for metering solutions for example. Coupled with our system integration expertise is our knowledge of network infrastructure design for building control and automation systems using the latest Web enabled interfaces and router technologies including Ethernet and Fibre Optic networks for medium to large installations.